Upon arriving in Chicago the other day, Eric Yelp-ed to find us somewhere to eat. 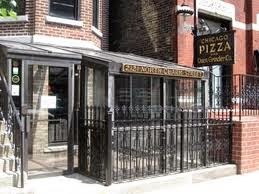 He decided on a cute little place near our hotel called Chicago Pizza & Oven Grinder Co. It was AMAZING. Instead of the traditional pizza, they had pizza-pot-pies. It looked like a chicken pot pie, but was filled with cheese, mushrooms and an amazing meat sauce. Of course we had appetizers and dessert, too. All of which were great. Aside from their amazing food, there was something else that really made our night, and started our trip off on the best foot possible. Our server. Yes he was great at the typical server duties (not always the case, I suppose), but that's not what stood out to us. He welcomed us with the greatest smile, and was so excited to share all about the restaurant with us, as it was our first time. Anytime he would ask how we were doing, or how our food was, we couldn't help but feel the honest sincerity behind the question. He really, truly cared that we enjoyed ourselves and our food. Was he the owner? Nope. Did he really haaaave to care? Not necessarily. I mean, I suppose his tip was riding on his service, but how often does that really effect how your server treats you? If we're being honest...not very often. Having been a server before, I am well aware of the difference between good and bad service. Eric and I can truly appreciate when we are well taken care of, and frankly, because we're still somewhat young (I said somewhat), there are many times where we don't get great service. When we do, we like to tip generously when we can and show our appreciation. That night was one of those nights. It was probably the best service we have ever gotten at a restaurant, and our server truly made our night so great. As we got our change back, we left our tip, one bill on top of the other, hoping to make our servers night as great as he made ours. We left our table and walked toward the front door, pausing for a minute to put our coats and scarves on. We looked over and our server was running towards us at the front door. "Excuse me! Did you mean to leave two [insert bill here]'s?" Eric and I of course smiled, and told him yes. Think about that. Our server, who could have simply kept the money thinking we left it by accident, ran across the restaurant to make sure we hadn't made a mistake and left him TOO MUCH MONEY! What?! Eric and I's hearts were truly full, and we were blessed by this sincere, honest stranger that night. What a beautiful lesson it was to me how simply being kind can have such a tremendous impact on someone, whether you may know it or not. I hope this holiday season is bringing each of you much joy! Always be kind.